The sky is grey and it’s not raining yet. The departure of my swimming wave (3.8 km / 2.36 miles) is at 7:00 am. The temperature of the water is 22°c (71° F), very pleasant. I position myself in the front-center of the swimmers’ group. Bad idea for my swimming skills. I noticed it soon enough, it was hard, with lots of waves and kicking! I got hit, involuntarily, several times and decided to move to the extreme right to have my own swimming space. It was a good decision. I’m calm and so far my swimming is going well. Time passes and the weather is changing fast. The waves get bigger, it’s getting harder with the ups and downs of the waves. I have some difficulty seeing the buoys, I then decide to set my sight on a focus point (the top of the mountain that I’m seeing in front of me) to stay in a relatively strait line. I don’t want to miss the last buoy where I have to turn around. It took me 2 hours to swim the distance; it was 20 minutes slower than my goal. I then said to myself: ‟Ok, now you have to catch up that gap on the bike ride, let’s go”. Within my first pedal strokes, it began to rain. I kept my focus even if the rain hit us sometimes very hard with a strong wind coming intermittently. I was happy that I had brought a small windbreaker jacket and long cycling gloves to keep me warm. My legs felt good, I passed many participants (I’m starting to catch up some time from my swimming). I have a constant rhythm; I suppose I passed around 300 athletes. In the 2nd loop, on route 117, the wind starts blowing straight at us, it slows me down. It has an effect on my average speed (it has decreased). I decide to keep a moderate pace to ‟save” my legs for the next challenge (after the 180 km bike, it’s a marathon). I ended with an average of 26 km/hour (16 miles/hour) on 180 km (112 miles). It was good for a ride in those hard conditions (rain and wind after the swimming). I was happy that everything went so well for me. After the race, my sister (who was a volunteer for the medical team), related to me some information about accidents involving many cyclists and some athletes who had to quit due to hypothermia. 2nd transition: 10 min. My mental state is strong, but my legs are stiff. I spray a good dose of Novarnica Sport on my legs before starting the marathon. What a relief, I love this product! Last step, I begin my marathon! It’s the part of the triathlon that I prefer. I felt good, and the rain had stopped. My legs are still in a good shape. I pace myself for a 6 minutes per km (6 min for 0,62 miles) rhythm. I met some friends on the way, we encouraged each other, and it gave me wings! Now, my 1st loop of 21 km (13 miles) is almost done. We are nearing the finish line; I can see it but I still have the same distance to run again. That is so hard on the motivation, the line is there but I still have 21 km (13 miles) to run. Oh boy! But, I’m so lucky, my sister was there cheering me on. I took a moment to hug her, it was enough to refill my energy and have the strength to end this challenge in a good spirit. Now, far from the village, in the darkness of the evening, I’m in my own state of mind. I ran at a good pace, but a bit slower compared to my first lap. I needed to adopt a new strategy because my legs are getting stiff. I decided to allow myself to walk 100 meters (yards) after each water supply station before starting to run again. I kept this strategy until I was able to see the lights and life in the Mont Tremblant Village. I can start hearing Mike Riley announcing the names of the athletes who are crossing the finish line. Soon it will be my name. My last km, I was surrounded by a crowd cheering us on… amazing feeling. I crossed the finish line with a time of 13h59! I had done it! 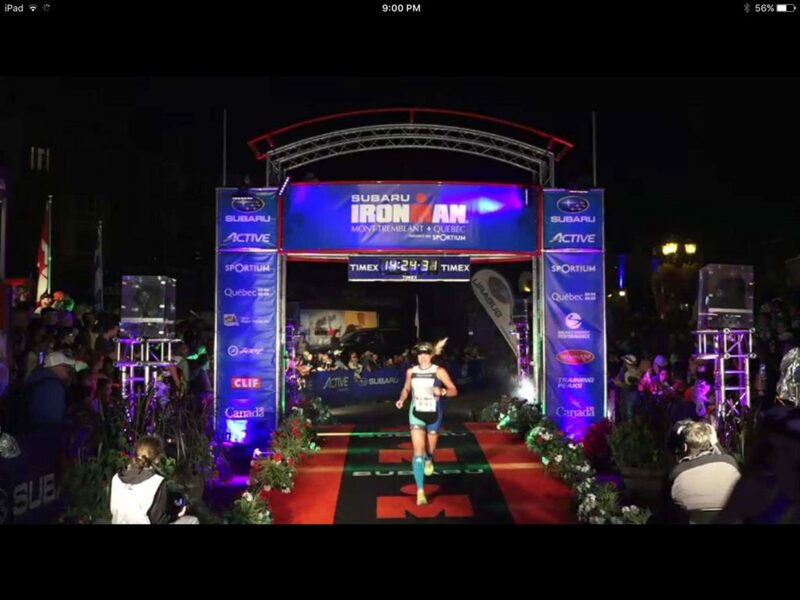 Now Mike Riley is saying in the microphone: Marie Eve Lamontagne… You are an IRONMAN! Wow, what a feeling! People I love are at the finish line to welcome me and be part of this exceptional moment. I am blessed, life is beautiful! I am fulfilled. That’s why sport and training are part of my daily life. They help me exceed my limits and be able to live fully. 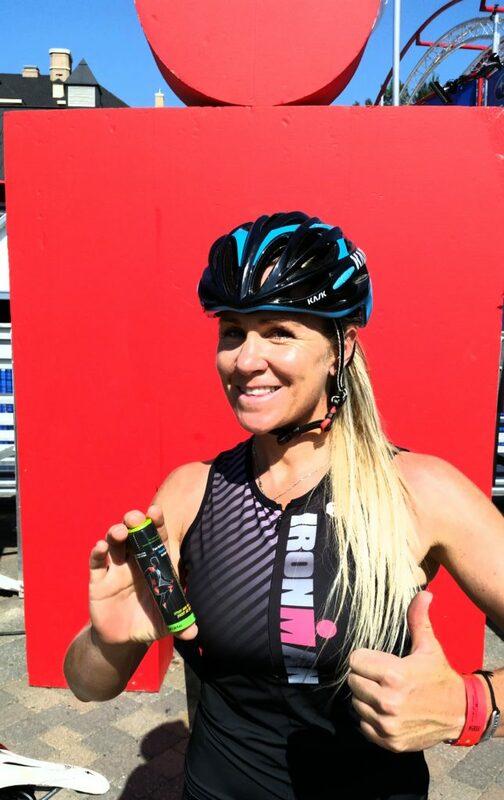 Another Ironman? Probably, but I have so many dreams and ideas. I’m certain of one thing, I am a long distance woman and I’m planning to continue to follow my bliss!